The most prominent food alga is Spirulina and it gets its name from the shape of the plant which looks like little spirals. The dark green colour of Spirulina comes from the high amount of plant blood or in other words, chlorophyll, which is only one molecule different to haemoglobin in human blood. No one fruit, vegetable or meat can provide everything the human body demands, but the tiny Spirulina comes so close to this ideal. Spirulina more importantly provide the wide range of essential vitamins, minerals and protein which the human body uses as fuel and catalyst. 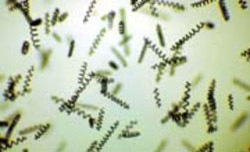 There are indeed many other tiny, single celled plants which can be found with the aid of a microscope, but none which have the unique properties of Spirulina. Protein: Spirulina contains unusually high amounts of protein, between 60 to 70 percent by dry weight, depending upon environment factors. It is a complete protein, containing all essential amino acids, though with reduced amounts of methionine, cystine, and lysine, as compared to standard proteins such as that from meat, eggs, or milk; it is, however, superior to all standard plant protein, such as that from legumes. Essential fatty acids: Spirulina has been found to have a high amount of polyunsaturated fatty acid, 1.5–2.0 percent of 5–6 percent total lipid. Spirulina contains enough amount of γ-linolenic acid (GLA), linoleic acid, stearidonic acid (SDA), eicosapentaenoic acid (EPA), docosahexaenoic acid (DHA) and arachidonic acid (AA). Vitamins: Spirulina contains vitamin B1 (thiamine), B2 (riboflavin), B3 (nicotinamide), B6 (pyridoxine), B9 (folic acid), B12 (Cyanocobalamin), vitamin D and vitamin E.
Minerals: Spirulina is a rich source of potassium, and also contains calcium, chromium, copper, iron, magnesium, manganese, phosphorus, selenium, sodium and zinc. Photosynthetic pigments: Spirulina contains many pigments including chlorophyll a, xanthophyll, betacarotene, echinenone, myxoxanthophyll, zeaxanthin, canthaxanthin, diatoxanthin, 3-hydroxyechinenone, beta-cryptoxanthin, oscillaxanthin, plus the phycobiliproteins c-phycocyanin and allophycocyanin.